I am a sucker for baking. I have loved to bake for as long as I can remember, and even considered going to culinary school to become a pastry chef. For a year and a half I worked at a bakery in a tiny (population of ~300 people) Washington town. When I applied for the job, I had romantic visions of early mornings spent manipulating dough into glorious breads and pastries. Instead, I would wake at 4:30 am and drive 30 minutes to work to be the soup and salad girl. Sigh. While I made those soups and salads to the best of my ability, there was simply nothing romantic about them, or the early mornings. Instead, I would watch with envy, from my little soup corner of the kitchen, as the town Frenchman would fold circles of dough over tangy fruit fillings, forming beautiful free-form galettes. Needless to say, I was excited to watch the 19th episode of Good Eats, as it is a baking episode AND the recipe featured is for a fruit galette. 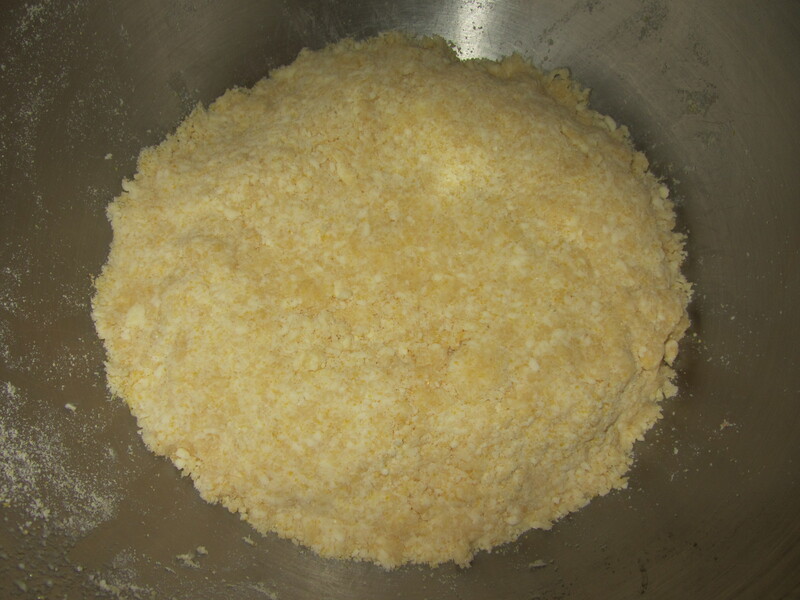 To begin this recipe, Alton has you start with your dough, combining flour, corn meal, sugar, and Kosher salt. 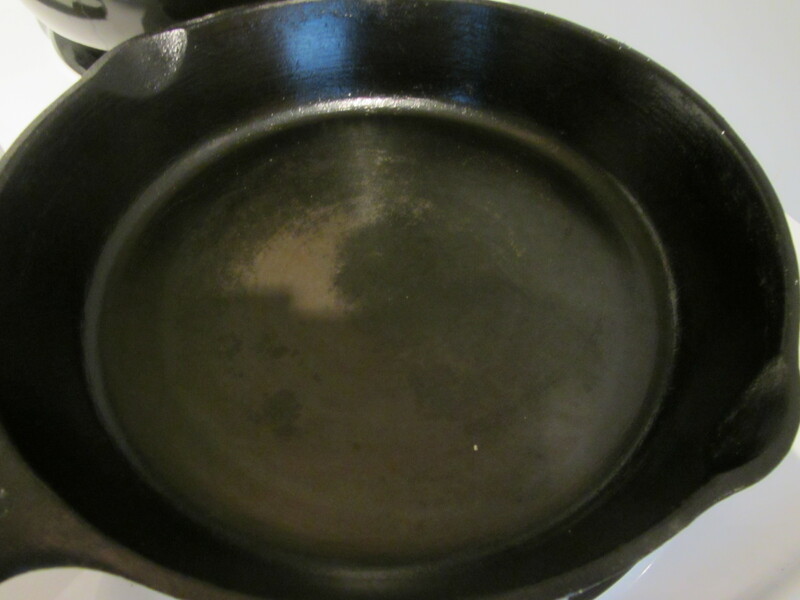 For this, he emphasizes that you want to use all-purpose flour, as it browns better. 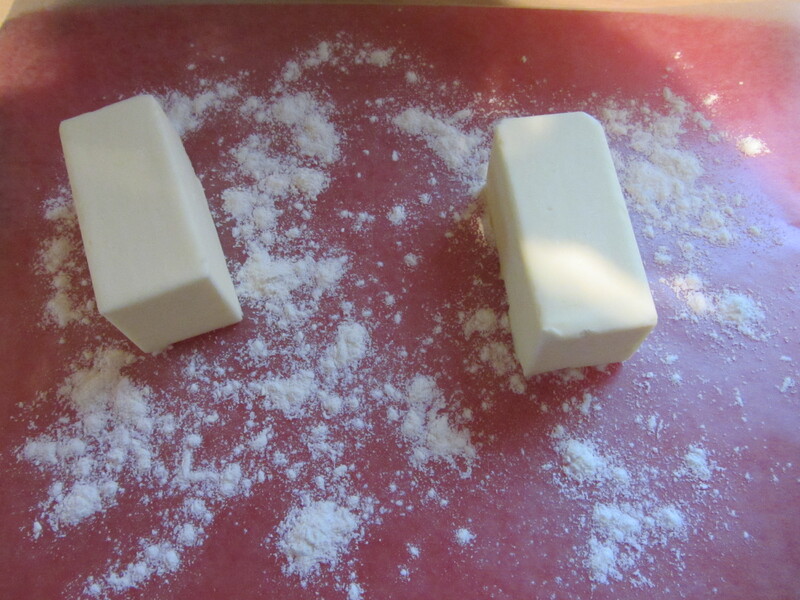 Meanwhile, you coat two sticks of butter in some flour and cut them into pieces. 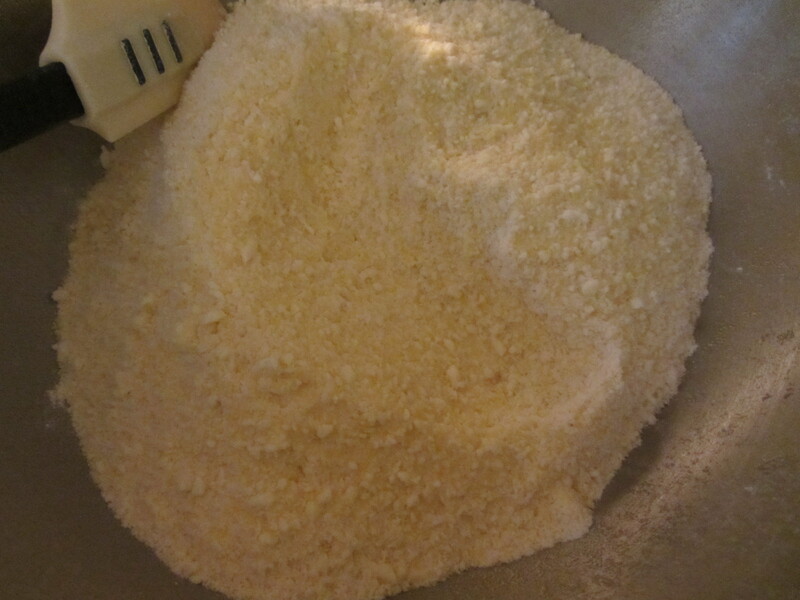 Both the butter and the dry ingredient mixture go into the refrigerator to chill, though you want to keep half a stick of the butter at room temperature. 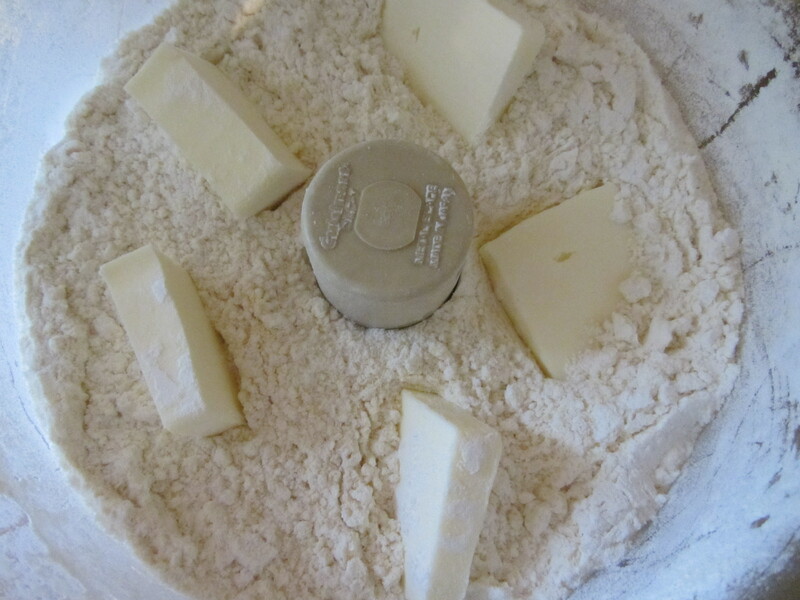 Once your ingredients are thoroughly chilled, you pulse your dry mix in a food processor, adding the room temperature butter, and pulsing until the fat is no longer visible. At this point, you add half of your chilled butter, pulsing about 10 times, or until you have a mixture with pea-sized lumps. 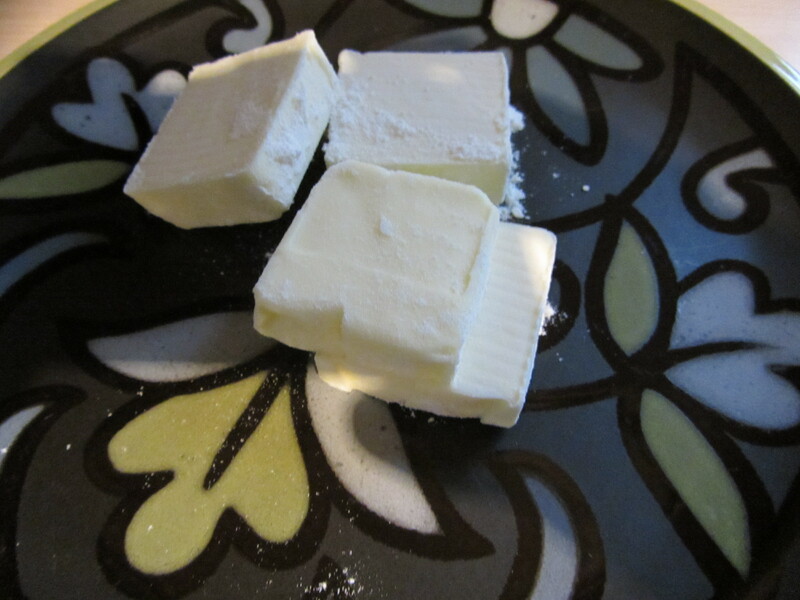 Adding half of cold butter. 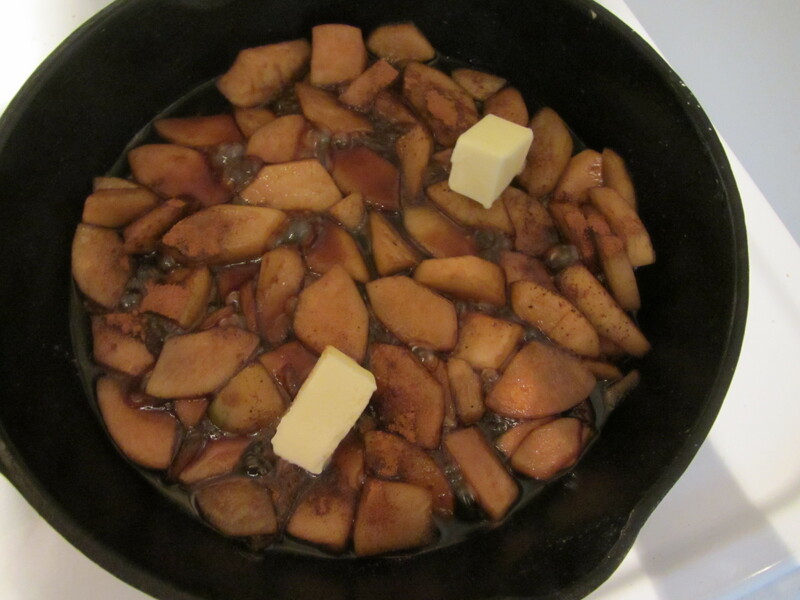 To this, you add the remaining cold butter, pulsing a max of 4 times. 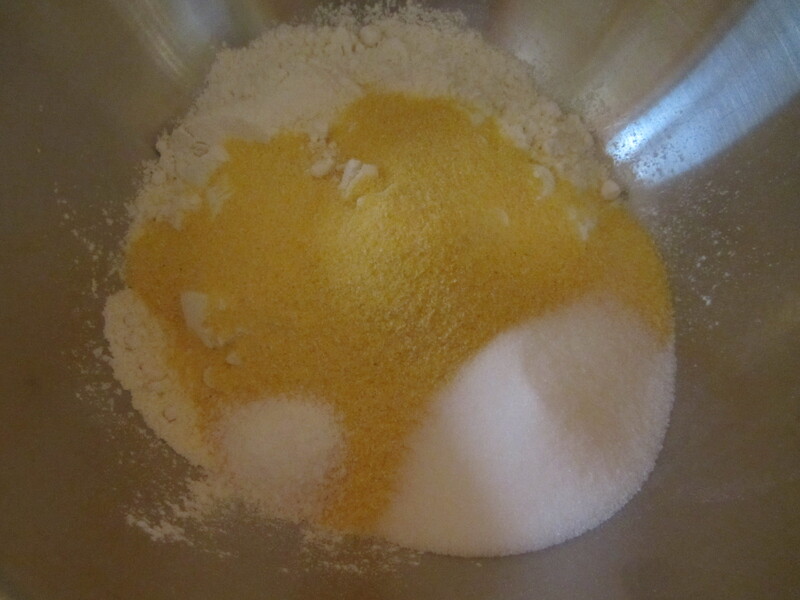 This mixture is placed in a metal bowl. The liquid for this dough is a combination of apple juice concentrate and water, which Alton recommends you put into a spray bottle. 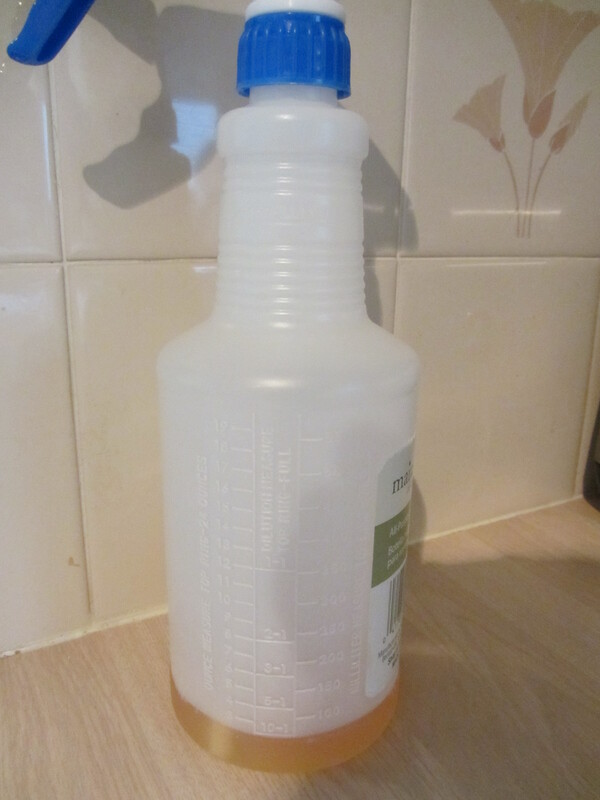 Spray bottle with apple juice concentrate and water. This liquid gets spritzed onto the surface of the dough, and folded in with a spatula, until you have a dough that holds together and breaks cleanly, without crumbling. Spritzing liquid into dry mixture. 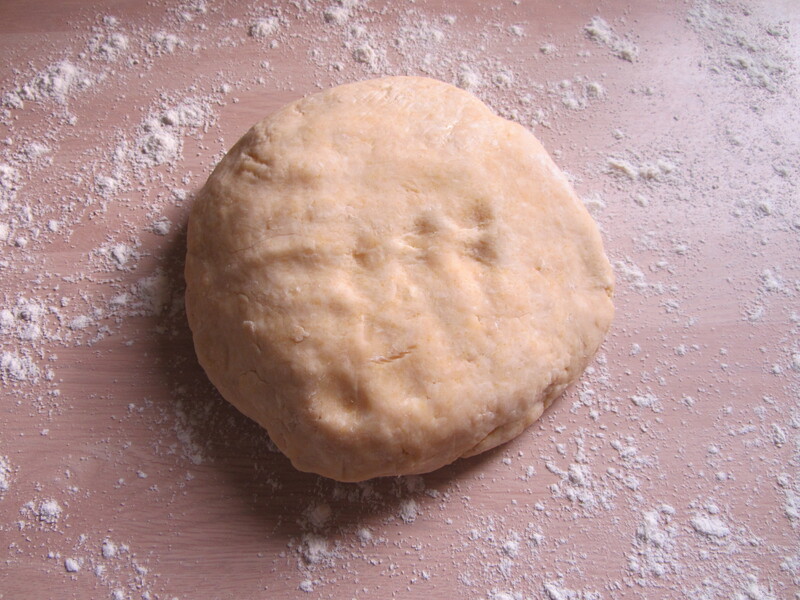 Once your dough has reached this state, you form it into a ball, wrap it in parchment, and put it in the refrigerator to chill. I ended up using twice the amount of liquid called for in the recipe before deciding my dough was close enough. In reality, my gut was telling me to keep adding more liquid. Foreshadowing. Final dough, after adding 2x the liquid called for. 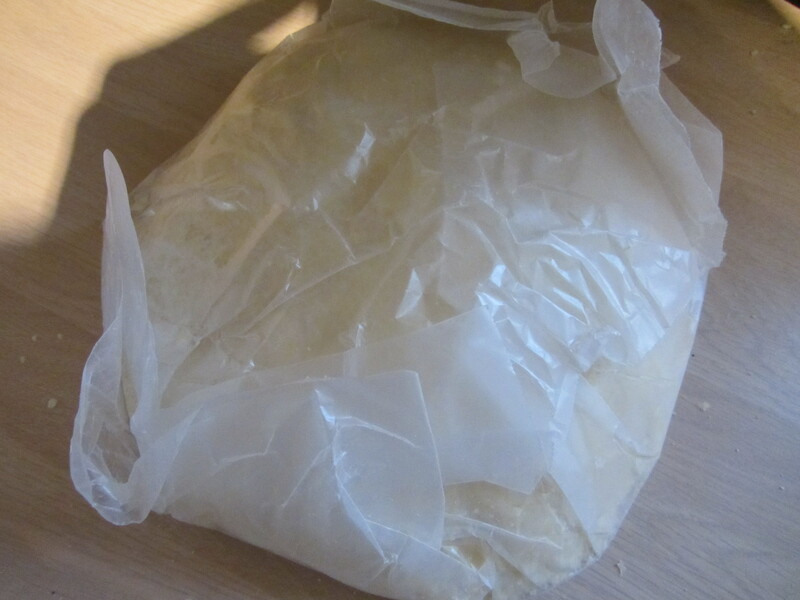 Dough wrapped to go in refrigerator. 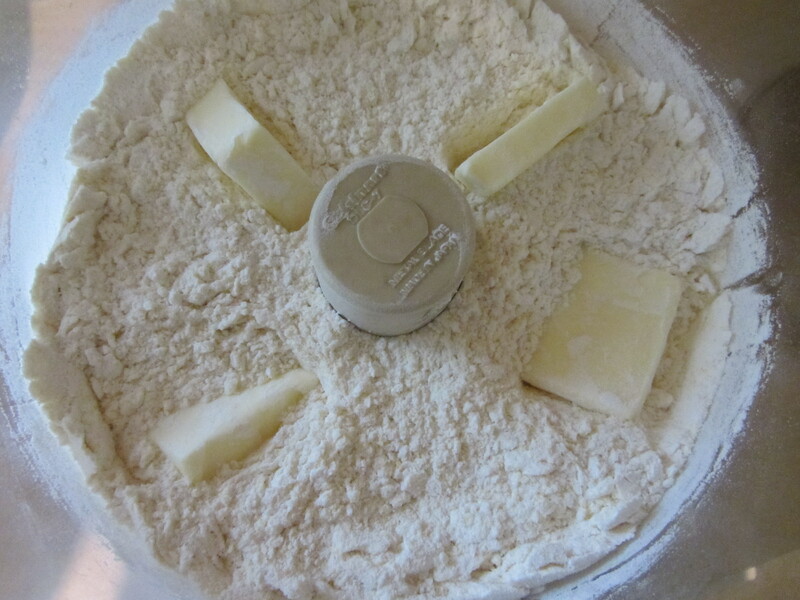 While your dough chills, you make the filling for your pie. 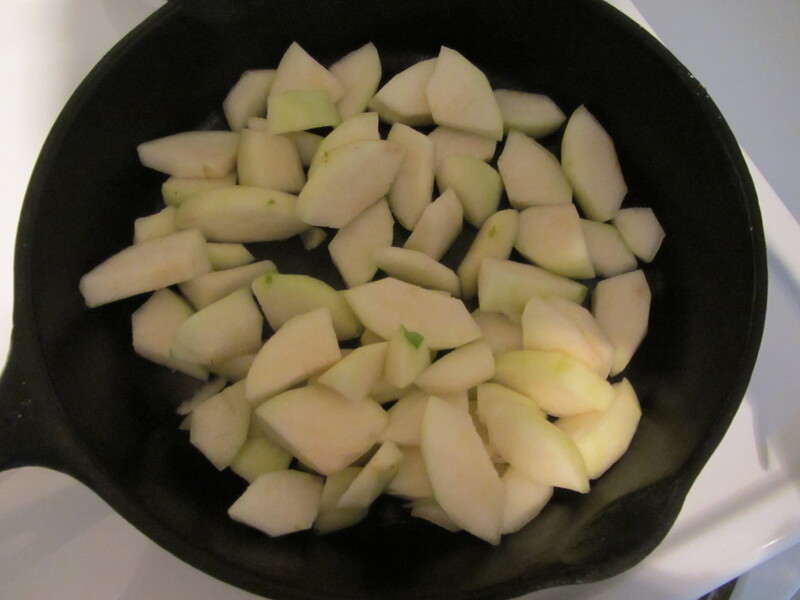 To a hot iron skillet, you add two Anjou pears, peeled, cored, and sliced. 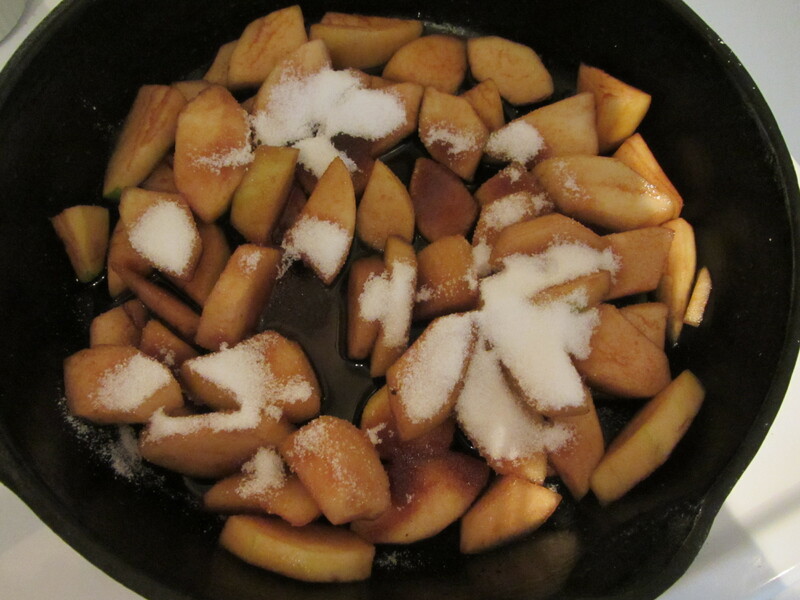 To the pears, you add balsamic vinegar and sugar. 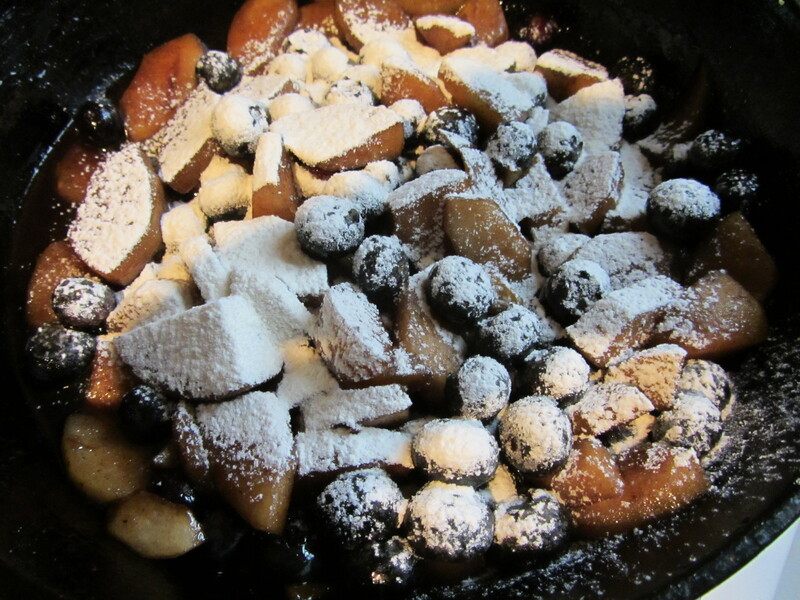 Pears, balsamic vinegar, and sugar. 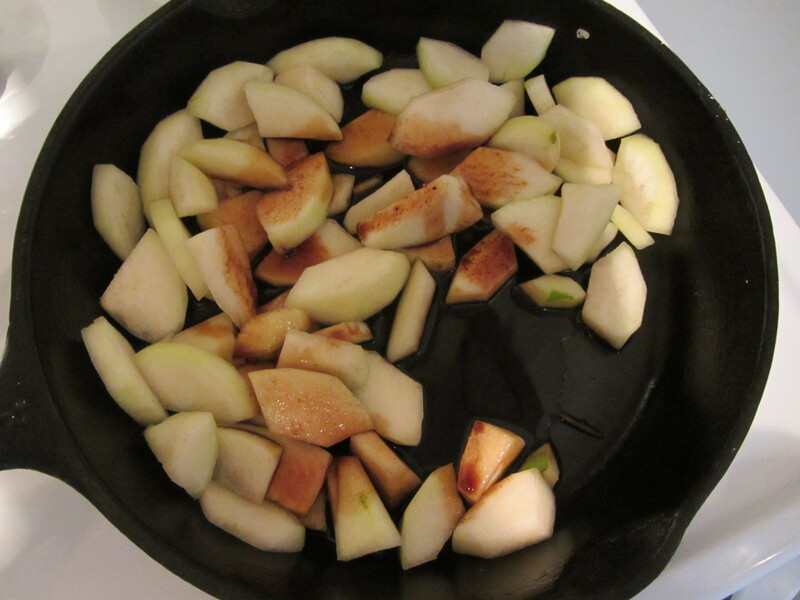 Once the pears have softened, you add nutmeg, cinnamon, and butter. 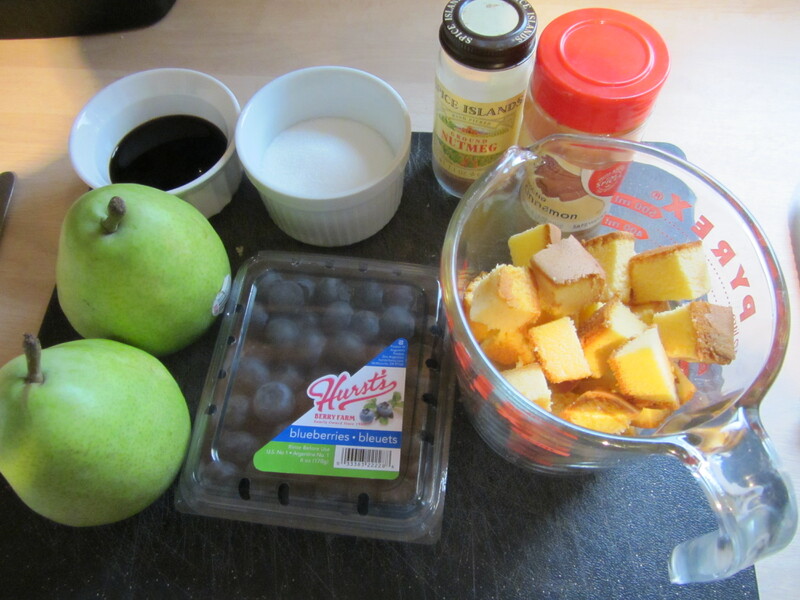 Pear mixture with spices and butter. 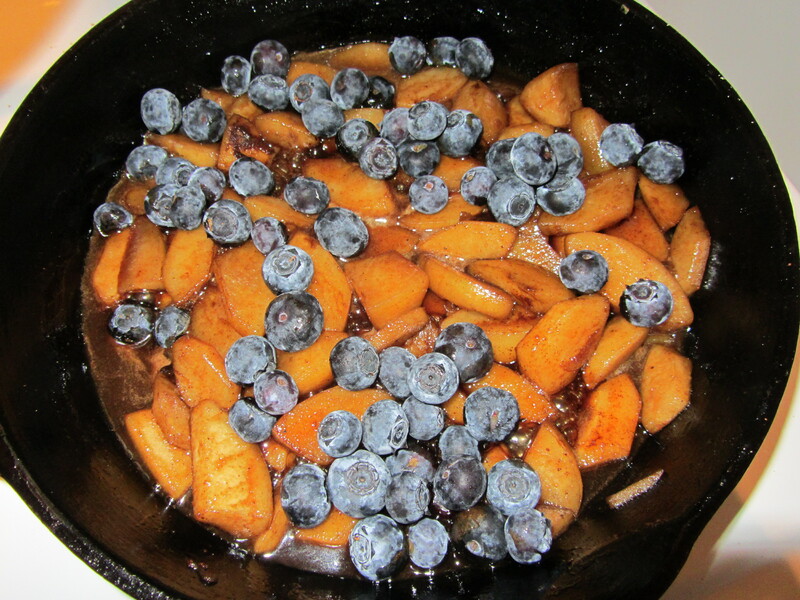 When the butter has melted, you add a cup of blueberries and remove the filling from the heat. 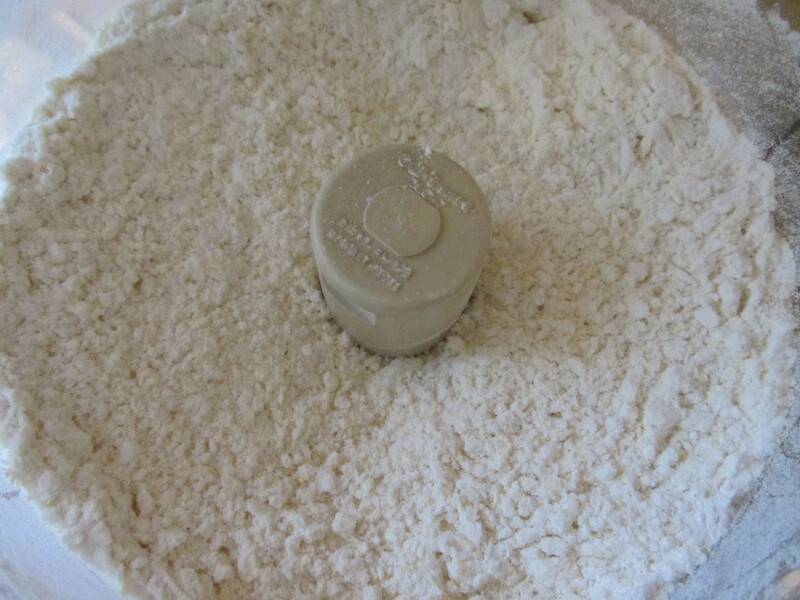 Some sifted flour is stirred into the filling to thicken it, and you allow it to cool to room temperature. I ended up running out of time to finish my pie in the day I started it, so I refrigerated my filling and dough overnight. 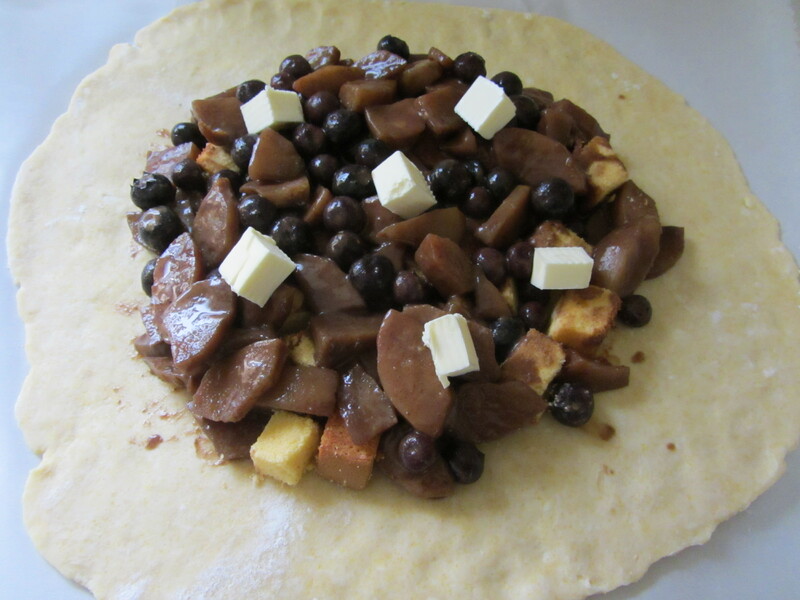 The next morning, I pulled my dough and filling from the refrigerator, allowing them both to warm up for a few minutes. 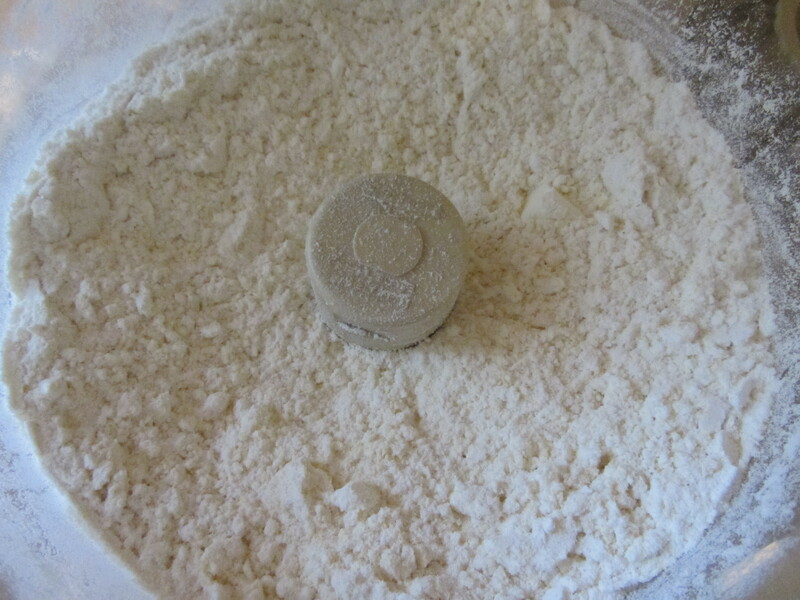 I sprinkled my work surface with flour and turned my dough out onto it. 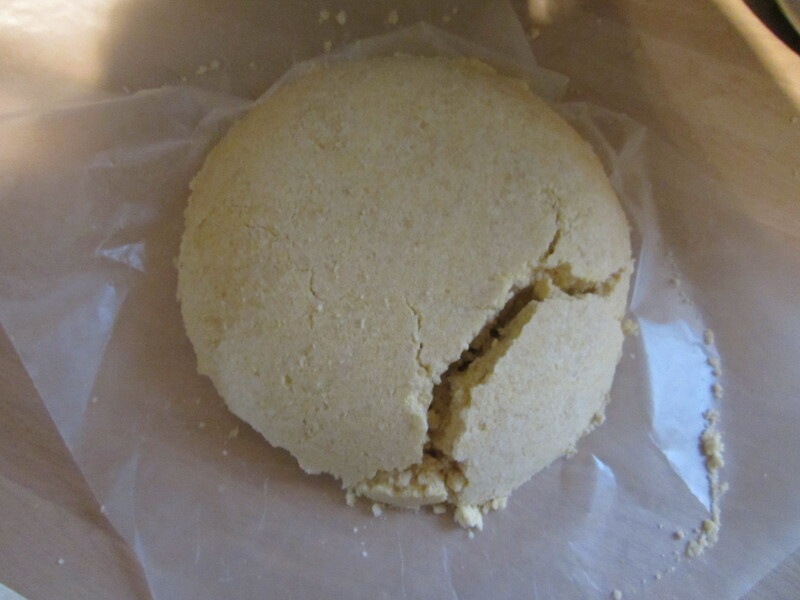 I could tell immediately that I should have listened to my gut the day before, as my dough was way too crumbly. 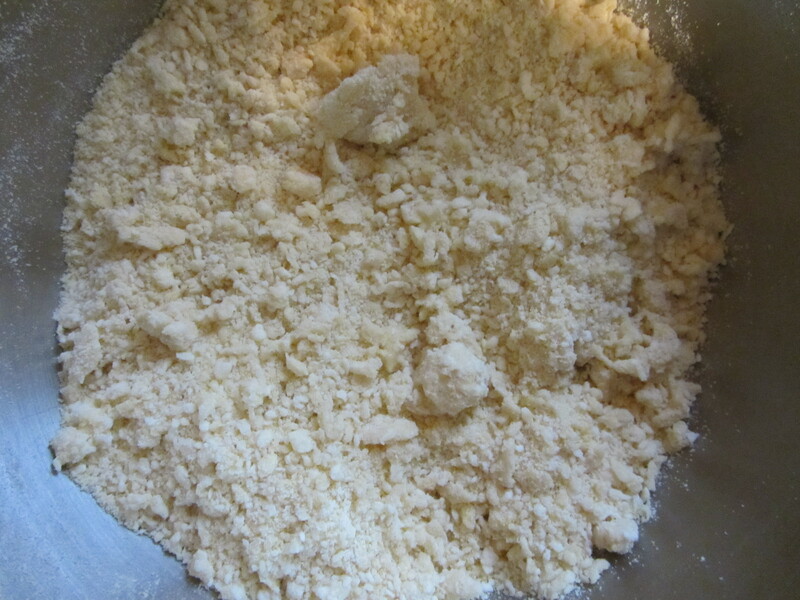 Dough that is too crumbly. Back into the food processor it went. 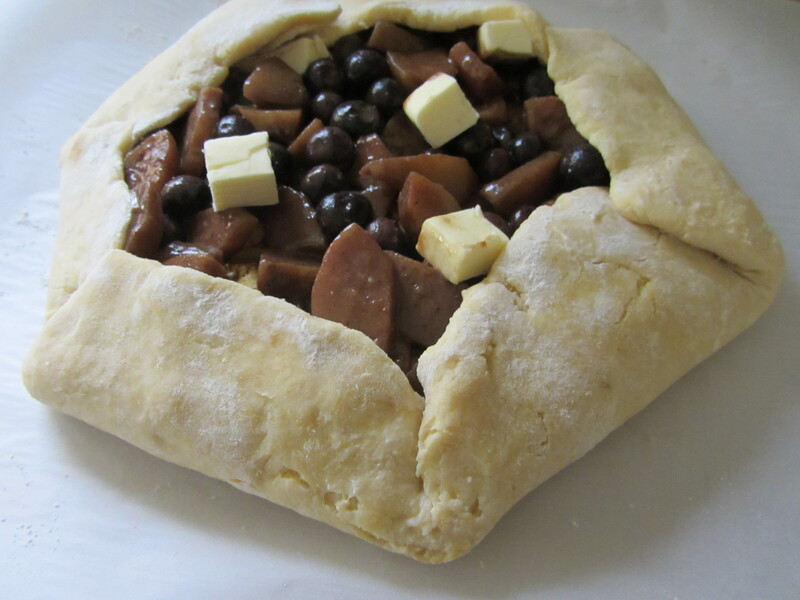 This time, I added cold water through the feeding tube until my dough was coming together in a nice ball. 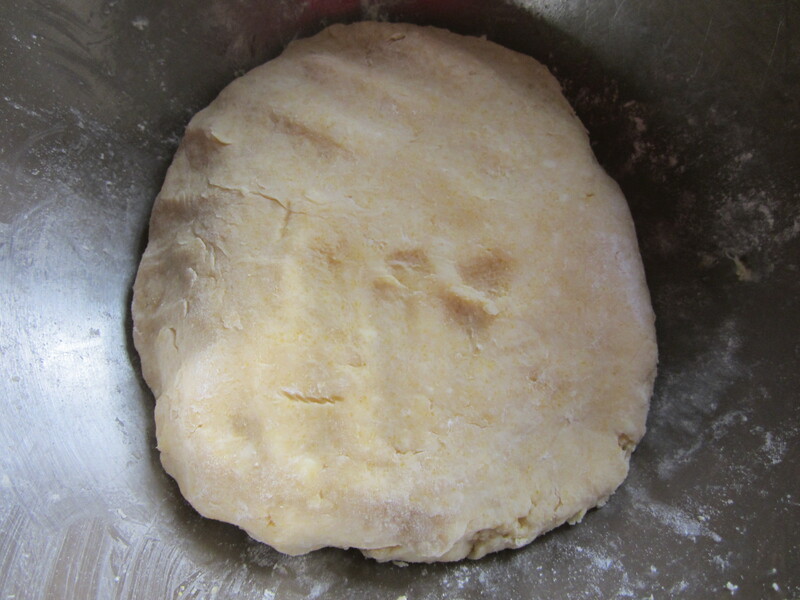 I worked my dough into a nice smooth ball, and put it back in the refrigerator for about 20 minutes. Finally, I was ready to assemble my pie. 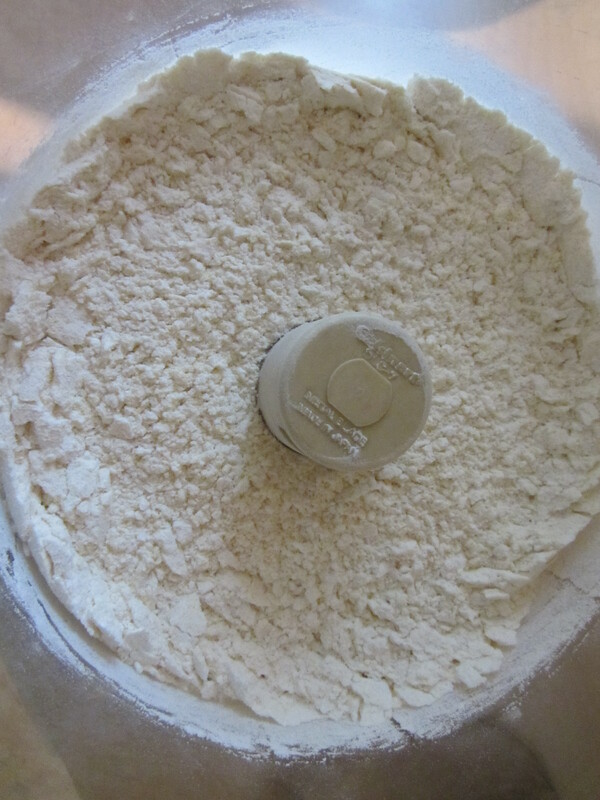 Proper dough after adding more liquid. Dough ready to roll out after adding more liquid. 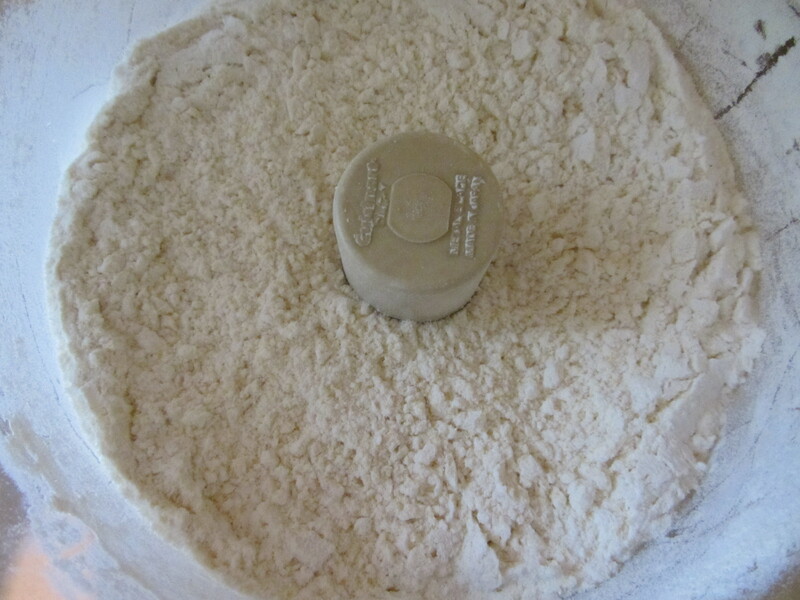 Alton tells you to roll your dough on a floured surface until it is 1/4″ thick. If your dough gets too warm, you can press it with a cold sheet pan, but I never needed to do that. 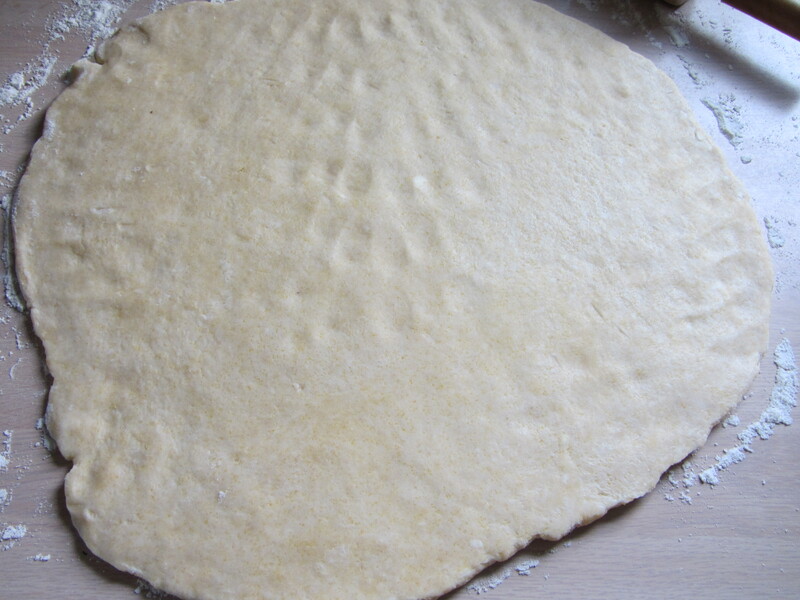 Once your dough is in a nice, even circle, you transfer it to an inverted, parchment-coated, sheet pan. 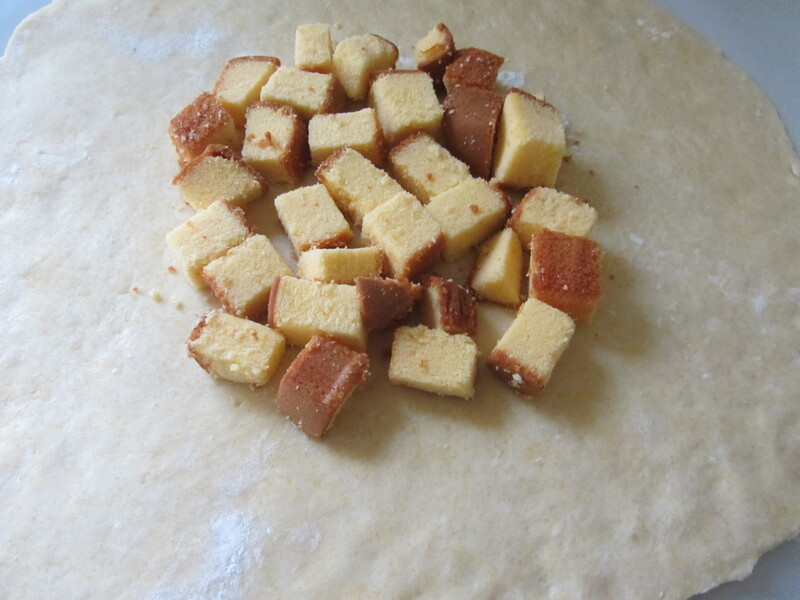 In the center of your dough circle, you place pound cake cubes (I used frozen pound cake), and top this with your fruit filling. 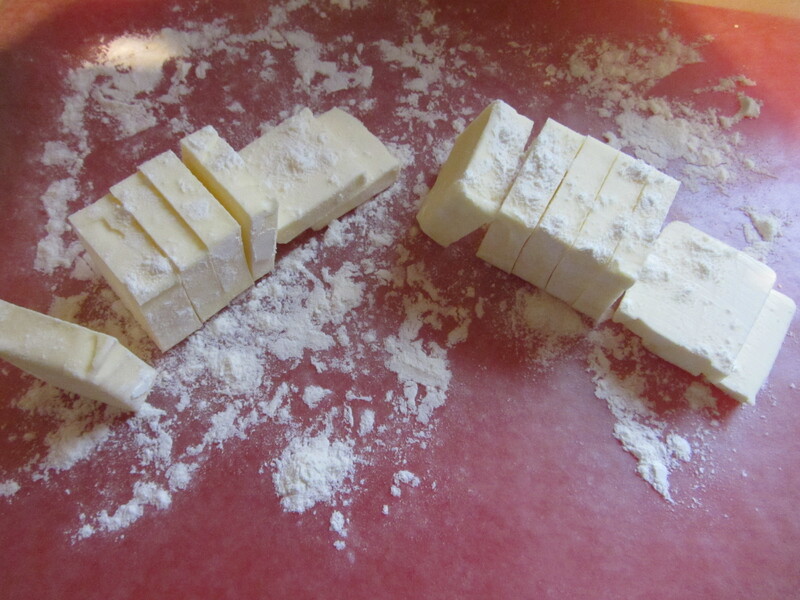 Some clumps of butter are dotted over the filling, and you can begin folding up your dough. Pound cake in middle of dough circle. Pound cake, fruit filling, and butter. You fold your dough in sections, overlapping the sections and sealing them with some water, until all of the excess dough is folded up. Your crust gets brushed with an egg wash and sprinkled with sugar, and it goes into the oven for 25 minutes. Brushed with egg wash and sprinkled with sugar. My pie was done in about 32 minutes, as it was golden brown and the pleats felt like they would break if you pushed on them. 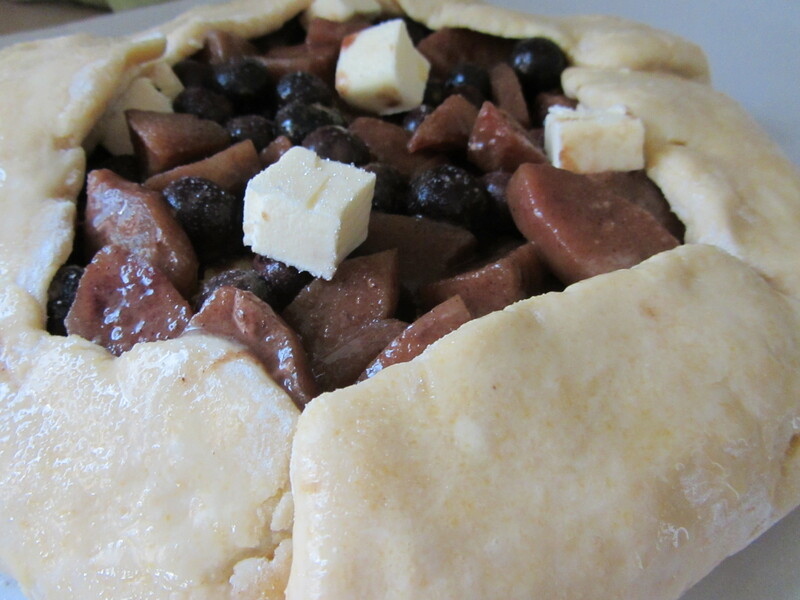 It is best to allow this pie to cool to room temperature before cutting. We ate this pie for dessert and/or breakfast over the next few days. It cut easily into wedges (even the very first piece), and had a nice combination of flavors and textures. Perfect first slice of pie. 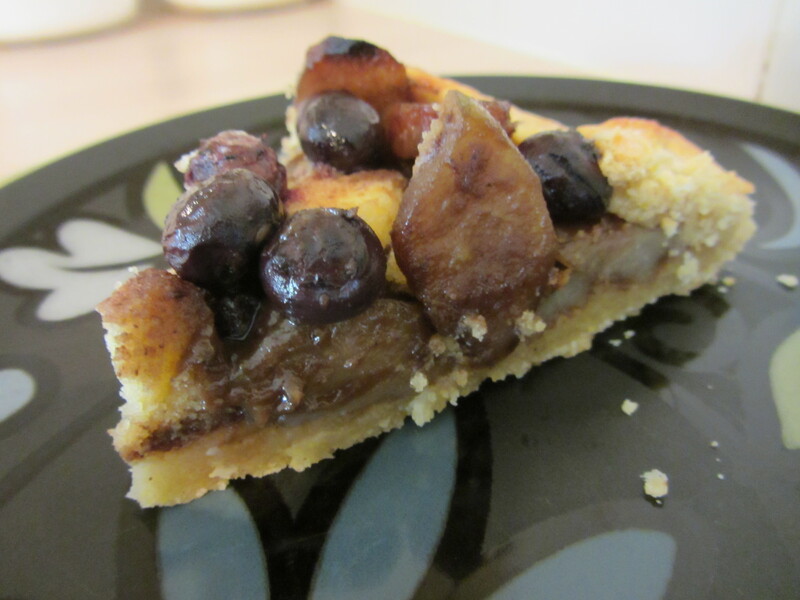 I really liked the addition of cornmeal to the crust, as it gave it an extra dimension of texture. The crust was flaky, buttery, and tender. 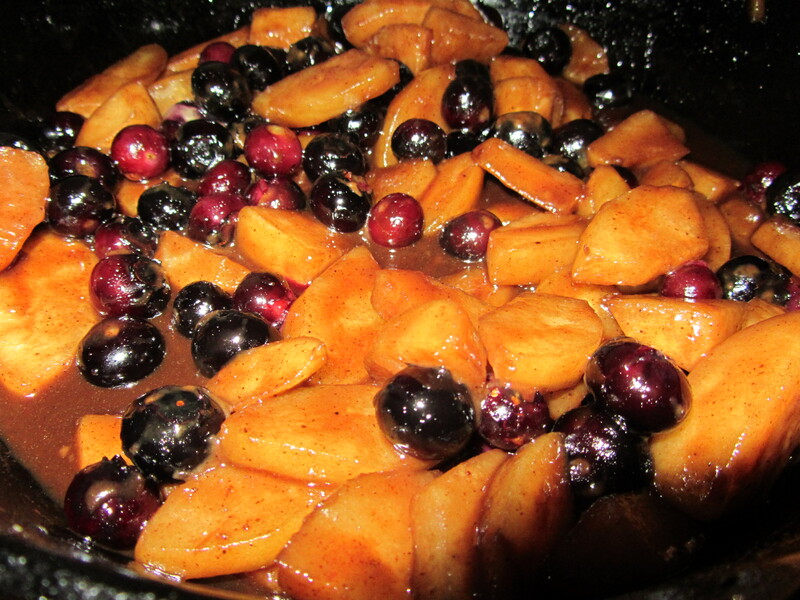 The pears in the filling were soft, but not mushy, and the blueberries gave a bit of tartness. The pound cake absorbed some of the liquid in the filling, which gave the cake a velvety, cheesecake-like texture. 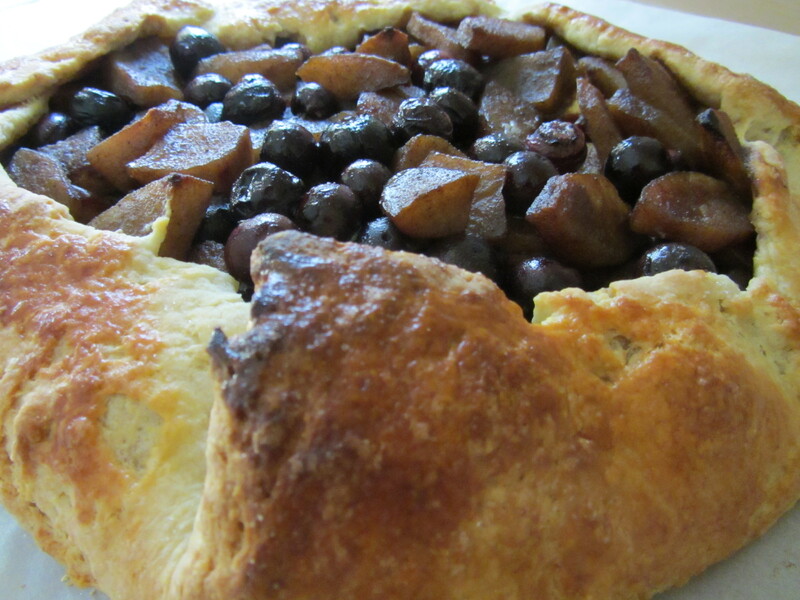 I will make this pie again, though I think it might be more fun to make individual galettes, rather than one big pie. 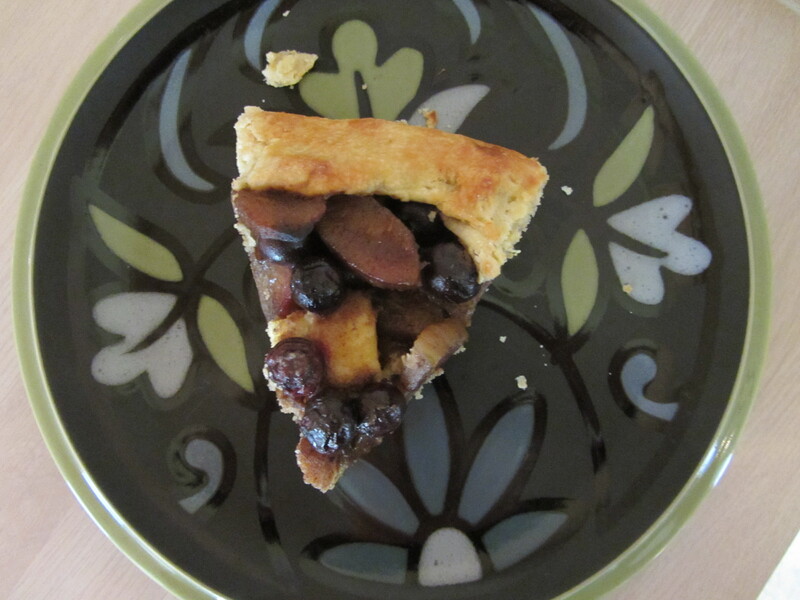 If you are looking for a different pie for Thanksgiving, this is a good one to try. Or, if you want a traditional pan-baked pie, you could still use the filling recipe from this pie to make a perfect Fall fruit pie. No longer do I need to lust over others’ galettes, as this recipe is an easy one to make at home myself.